On March 16th, local children’s book authors Heidi Stemple and Jane Yolen captivated the audience as they spoke about their family’s passion: birds. 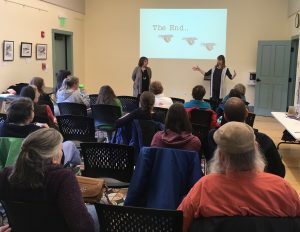 Hilltown Land Trust, Kestrel Land Trust, and Arcadia Wildlife Sanctuary partnered with the Westhampton Public Library to bring these authors to the southeastern corner of Hilltown Land Trust’s service area. The three books highlighted were Counting Birds – The Idea That Helped Save Our Feathered Friends, Crow Not Crow, and Fly With Me. Jane is a New York Times best-selling children’s book author and Heidi’s book Counting Birds – The Idea That Helped Save Our Feathered Friends has won six awards to date. Humor and facts tumbled about as this mother/daughter team shared their family’s long-time commitment to participate in Audubon’s annual Christmas Bird Count. Their presentation combined live reading with slides so the audience could view the illustrator’s drawings while hearing the text. First, Heidi read Counting Birds, an account of the first Christmas Bird Count, illustrated by Clover Robin. This was followed by Jane’s reading of Crow Not Crow, illustrated by Elizabeth Dulemba. Jane also read a few poems from Fly With Me, a book full of bird facts, stories, poetry, and stunning photographs. After the presentation, the audience asked an abundance of questions about writing and publishing as well as the Christmas Bird Count. Books were sold and autographed. Heidi and Jane gave an excellent, engaging, and casual presentation that focused on the value of birds. Hilltown Land Trust is fortunate and appreciative that they volunteered their time and we hope to have another event with them in the future.